Also called a "hot stick", these little units are indispensable and much handier than the old ones which had contact leads and a bulb which simply illuminated when the leads contacted voltage. First off, no leads means you don't have to have exposed wires to determine the presence of current. This one by Klein to the left is also self diagnostic and pretty much idiot proof. False positives (indicating current) are pretty common with these and can be annoying and they are no substitute for a meter when troubleshooting. But they are handy as all get out. 2. A GOOD Quality Electrician's Tool. Like a lot of people, I had always used a cheap dime store version of these and cutting wires you wanted to strip and not cutting through wires I wanted to cut was a common occurrence. 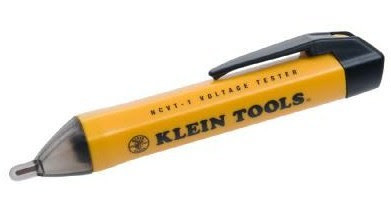 I can vouch for the Klein model pictured, it is the perfect size and strip wires perfectly EVERY time. It's a very high quality piece of kit and worth what I paid for it ten times over. 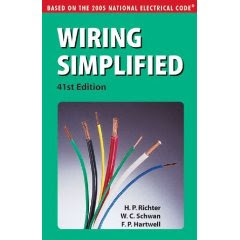 The book below has been a tremendous help to me and I reccomend it. It's important to do things the right way (to code) so that the next person down the line understands what you did. Think of their safety as well as your own, yellow wire might have been on sale, but if it's not the correct color and size for the application, you are endangering yourself and others. When in doubt consult the code, if still in doubt, call a pro, it's not worth the risk.